If you've been catching this one up on DramaFever, you might not have gotten to the "I know it looks cool but the story is getting so slow" part yet. The drama has aired 40 episodes in China so it has officially passed its half-way point. The pacing has entered the dragging phase for a while and there's no sign of it speeding up any time soon (probably never will). While the cinematography is still great and the acting still on point, it does require a fair amount of fast forwarding to sit through the episodes even though you might be the most patient person on the planet. I have heard a lot of rumours about this drama and did some in-depth digging. I know no one on the inside so there's nothing I could confirm for sure, but I do believe most of what I found is pretty close to what actually happened to this production, so if you're interested to know more about the drama behind the drama, read on. 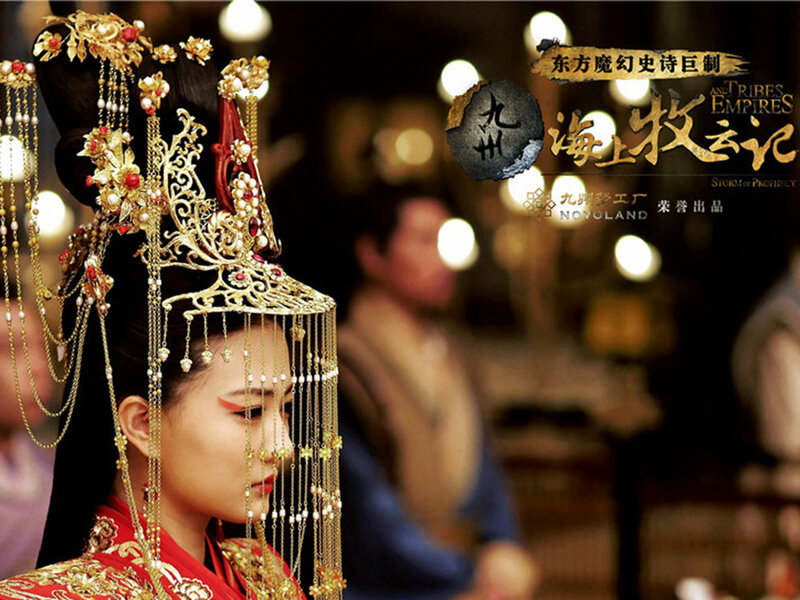 Tribes and Empires (九州海上牧云记）started filming on Aug 30 2015 and finished principle photography in May 2016. The crew took to the desert and snowy mountains of Xin Jiang (where the very lovely Dilraba comes from) and Japan to film on locations. The entire budget of this drama is over 400 mil RMB, so it's about a bit shy of 70 mil USD. I have spent a lot of time explaining the background story of the novel and the creation of the fantasy world Jiu Zhou in my first impression video on YouTube. But thanks to the brainless person in charge of the official account that uploads this drama on YouTube, the video was taken down. So if you didn't catch it, here is a quick recap of the origin of Jiu Zhou (Nine Territory/Regions). Back in early 2000s, a group of 7 Chinese online fantasy writers got together and created a fictional world named Jiu Zhou (九州), upon which they had planned to write a series of fantasy novels. This was a response to the fact that the genre in China is still very young and undeveloped, while most world-class famous fantasy works are based on western civilization (eg. Lord of The Rings/GOT). These writers wanted to build a world based on Chinese/Asian civilization - so Jiu Zhou continent was born. In 2005 they started a Fantasy novel magazine based on this world which got extremely popular and gathered a lot of novel fans. Two main writers of this group had some serious creative/management dispute that resulted in a lot of fandom clashes online and causing the group and the publicaiton to eventually break apart in 2006-2007. Some of the original members then formed the production company Novoland International Cultural Communication Ltd. (九州梦工厂), which is the company that produced Tribes and Empires. Tribes and Empires was written by one of the two main writers of the original 7 who created the fantasy world. The drama version was helmed by director Cao Dun. Cao Dun is a Gold Horse winner in cinematography, and that's what he is - an excellent cinematographer. This explains why the drama looks so great visually. But he is neither a director nor a producer by trade, yet for this drama, he was hired as both. So essentially he took all three main jobs for this drama, and this is both this production's blessing and curse. Without much experience in budget management, the production ran out of money mid-shoot. To get more investment, Cao edited together a long trailer (40min-1hr) with the best shots he had filmed by then. Being a great cinematographer and editor, that trailer blew people away. It made Hunan TV decided to put this drama up as its 2017 opening show, and collected 200 mil RMB fund from various investors to make the rest of the filming possible. Yet still the money was not wisely spent, there was a battle scene in the drama that cost an insane portion of the budget which was only written as 20 characters in the book! So when the filming ended, the budget left was not enough for all the CG work, resulting in parts of the drama having great CG and parts having weirdly bad CG. To pay back the amount of money put in, Cao made this drama (rumoured to be only 40 episodes long in the first draft) 80 episodes long to sell it for more money. So when Hunan TV eventually got the first cut on hand, it was surprised that it was so long (Chinese TV stations have annual quotas, you can only air 80 or so episodes of period drama per station, so it obviously can't take T&E as it is for it would eat up all its period drama quota). Then the main leads don't even show up in the first 10 episodes, which runs the risk of people running out of patience watching it. Hunan TV demanded the drama to be cut back to 55-58 in length, which would mean it would be sold for a lot less money. HunanTV also suggested to completely cut the third lead Zhou Yiwei's character Shuofeng Heye's storyline. Now, here is the secret, director Cao, Shawn Dou (who played second lead Muru Hanjiang) and Zhou Yiwei all belong to the same company! So obviously the director is not going to cut his own colleagues' parts out, if anything he down played Huang Xuan's character Muyun Sheng's role, who is really the first lead in the original story/script, because he is NOT from Cao's company. 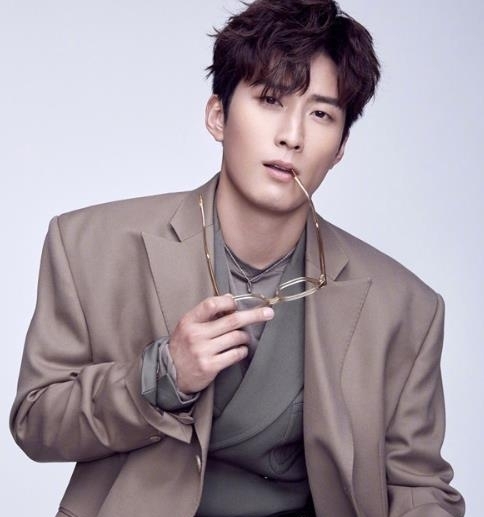 Huang Xuan as the 1st lead but had his screen time reduced because he's not from Sa Ren Culture (仨仁文化), which the other two leads and the director belong to. Dou Xiao as the 2nd lead, I love the younger actor who played his teenager version, not that Shawn is less impressive though. Zhou Yiwei as the 3rd lead, I like his line but he got a lot of screen time added to his role probably due to the director's own preference. Due to all these reasons above, Hunan TV returned the drama and decided not to purchase or air it. This is why now Tribes and Empires ended up being a pure web drama, having only 5 episodes cut out of the 80, and being so slow and draggy because it really should just be a 40-50 episodes long story. This drama is a great example of the pitfalls an IP drama could run into without an experience production company taking the helm. The story had great potentials, the actors are all great, if only the director stayed just as the cinematographer and someone who knew how to tell a story took the chair behind the camera, and a real producer who understood how money should be spent was on board. I still watch and download 4K version of this drama because it just looks too good and practically begging to be edited into some fan videos. I wish there could be a deducted cut version of this drama so I could watch it without skipping ahead. If you didn't know all the background drama about this fantasy drama well now you know, does it complicate your feeling about this drama? Do let me know and share your thoughts. Live long and happy drama watching!